Custom Labels for a Personalized Touch. 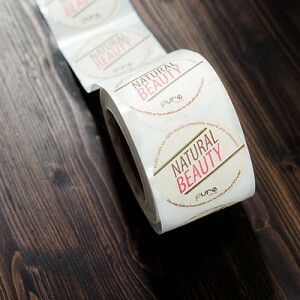 PURE Labels custom printed labels are available in a wide variety of sustainable material and can be used to add a personal touch to invitation envelopes, wedding favors, even for personalized wine or water bottle labels! Eco-Friendly Wedding Favors Your Guests Will Love. Get creative and think of wedding favors that guests will actually use! 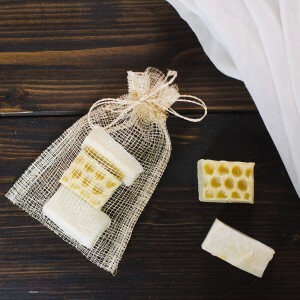 Products such as handmade soap, food items such as fair trade chocolate, or plantable items such as seeds, seed bombs or small plants all make wonderful wedding favors. Package them with Distant Village Sinamay bags for an elegant natural touch. Sustainable Catering. Instead of using plastic disposable foodservice products, choose a sustainable option such as the food service products available from Onyx. Compostable Confetti. Confetti can be the cause of a lot of waste at weddings, especially if it is not environmentally safe. 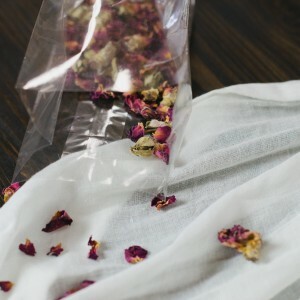 Opt for using seeds or dried flower petals instead of more traditional options, and package the biodegradable confetti in Distant Village compostable cellophane bags for a complete sustainable solution! For more sustainable packaging options check out the Distant Village Etsy Shop, or contact us for a custom order!